Once an individual with bilateral above knee limb loss has built up the necessary strength, balance and endurance using "stubbies" or fore shortened prosthetics for an extended period of time, it will become time to consider a knee technology in order to move into the next phase of mobility. A knee system that provides consistent response and stability is necessary in order to give the user a system that they can learn to trust in their daily activities. There are many different types of microprocessor controlled knee technology available today that have unique ways they regulate the yielding support of the knee. With all prosthetic systems, there is always a compromise when considering a specific technology. For example, a knee may contain a powered actuator that can thrust the user up out of a chair or up stairs or provide added push off during walking, but the trade off is short battery life and erratic movements as the system tries to interpret the users movements. We have evaluated all microprocessor knee systems to determine the functional advantage or disadvantage for use with an individual with bilateral above knee limb loss. Through years of trials and research as well as hundreds of patient feedback from actual users with bilateral limb loss, we have determined a criteria that has proven most effective for maximum function and ability. 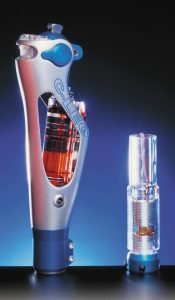 The original C-Leg was introduced by German company Ottobock in 1997. It was the first computer controlled hydraulic knee system to regulate both swing and stance resistance with motorized valves. Sensors in the shin tube take readings of whether the patient was putting pressure on the heel or the toe. The readings are sent to the computer 50 times per second and along with readings from a knee angle sensor, the computer would adjust the valves to regulate the hydraulic fluid depending on the gate cycle. When the sensors read pressure on the heel, the computer regulated the stance phase yielding to give smooth and consistent support for walking down a hill or down stairs. At toe off, the sensors read toe pressure and know the knee should remove hydraulic resistance for swing release, providing adequate toe clearance as the lower limb extends forward for the next step. It is this unique ability to accurately and consistently detect what the sensors are registering and quickly adjust the motorized valves in the hydraulic cylinder that gives an unprecedented level of stability. This is exactly what a bilateral above knee amputee would need in order to be able to navigate hills, ramps, stairs and uneven terrain completely independent of assistive devices. Most individuals with bilateral above knee limb loss, must rely on special vehicle adaptations to allow them to drive again. These can be "hand controls" that attach to the gas and brake pedal and can require holes to be cut into the vehicle for the control rods to extend through. There are other systems that allow the user to drive via a "joy stick" control that has been used with individuals that also have upper limb involvement. The downside of these adaptations is the added expense, permanently modifying the vehicle by cutting holes in the dash and most importantly, this limits the user to one special adapted vehicle that they can drive. One of our patients shared his experience with using "hand controls" in his vehicle after he lost both legs above the knee and an arm above the elbow. He was driving on the motorway and was coming to an intersection with a red light, as he pushed on the control rod to apply brake pressure, the mechanism broke off! Fortunately, there were no other cars in the intersection as he flew through it uncontrolled, he put the car in neutral and steered off the road into the grass to help slow the vehicle but unfortunately, ended up hitting a tree. The results were a severely damaged vehicle but it could have been much worse! With our patients, since 2001, we have utilized a feature of the C-Leg that is critical for an individual with bilateral limb loss. It is the unique ability to switch into an additional programmable mode setup by the prosthetist, that allows for greater flexibility than other systems. 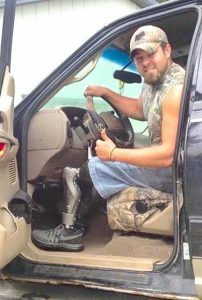 In most cases with individuals with bilateral limb loss, they request being setup to allow them to drive with their prosthetic legs. The programmable mode is setup to keep the knee from collapsing when the user goes from the gas to brake pedal. This has proven to be a very efficient and simplistic way for an individual with bilateral limb loss to drive a vehicle without the need for adaptive equipment. More importantly, it allows them to drive any vehicle that can be especially critical in emergency situations where someone is injured and the amputee needs to drive them to the hospital. The "driving mode" is activated either by a key fob remote control or the user can bounce on the toe three times in one second to activate the mode. Some individuals with bilateral above knee limb loss have chosen to drive a manual transmission vehicle using their prosthetics. It is a personal preference of the user whether we setup a mode for the left leg to operate the clutch, but most find no additional mode is necessary to use the clutch. There have been a lot of improvements made since the original C-Leg was introduced in 1997. With the advancement of computer processing power, bluetooth control, smart phone apps and other developments, the knee systems that are providing the most function and efficiency for a bilateral above knee prosthetic user still utilize the basic hardware framework of the C-Leg...an array of sensors fed into a microprocessor to regulate the hydraulic fluid by motorized valves. 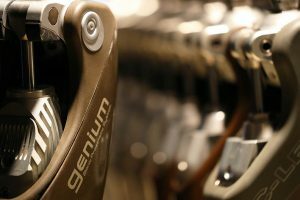 The Genium X3, Genium and C-Leg 4 all use several sensors including a gyroscope and 100 times per second processing to make more accurate control of the motorized valves. The gyroscope tells the knee where it is in 3D space, similar to a Nintendo Wii Game controller. This makes the knee much safer when taking steps backwards, preventing an unexpected collapse. All three knee system provide consistent hydraulic yielding when walking down hills, ramps or stairs to give the user regulated support lowering them naturally with each step. The Genium X3 and Genium feature 5 day battery life, 5 additional programmable modes, walk to run function, deliberate stance lock for bilateral users and a stair climbing function to allow for step over step stair assent. They both also include the OPG (optimized physiological gate) functionality that provides natural and computer regulated stance flexion as well as very smooth and natural walking gate. The Genium X3 is water and corrosion proof with an IP68 rating. 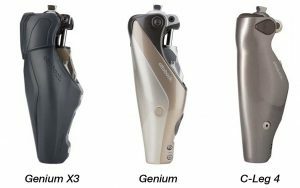 The Genium is splash proof and rated IP54 while the C-Leg 4 is rated IP67, both can be exposed to fresh water, not salt water or corrosive liquids. The overall build height has been reduced for these three systems from the previous C-Leg design, allowing individuals with longer residual limbs to utilize more energy storing foot systems. It takes a clinical expert with years of immersion with successfully fitting individuals with bilateral above knee limb loss in order to achieve the most efficient results and maximum functional outcome. Please check out our media library to see microprocessor knee systems in action from bilateral users that depend on their prosthetics full time in their daily lives.